A new video tape purportedly made by al-Qaeda leader Osama Bin Laden has urged the American people to embrace Islam in order to stop the war in Iraq. Unnamed US officials said they believed the speaker, who makes no overt threats against the US, was indeed Bin Laden. It is his first video in three years. The release of the tape comes near the sixth anniversary of the 9/11 attacks. US President George W Bush said the message was "a reminder of the dangerous world in which we live". "It's important that we show resolve and determination to protect ourselves, deny al-Qaeda safe havens," said the president, who is on a visit to Australia. Date references suggest it may have been made as recently as this summer, US officials studying the tape said. A short excerpt from the 30-minute tape was aired by al-Jazeera TV on Friday evening. It shows Osama Bin Laden sitting at a table, dressed in a white robe and turban and beige cloak. His beard looks shorter and darker than in the video issued in 2004. You made one of your greatest mistakes, in that you neither brought to account nor punished those who waged this war [in Iraq]. Beneath him a banner reads in English "A message from Sheikh Osama Bin Laden to the American people". The speaker makes no overt threats to the US and did not directly call for attacks, according to transcripts of the tape obtained by several media organisations in the United States. Instead, he tells the American people that they have failed to persuade the Bush administration to stop the war in Iraq. "You made one of your greatest mistakes, in that you neither brought to account nor punished those who waged this war," the speaker in the tape says, according to the transcript obtained by ABC News. "You permitted Bush to complete his first term, and stranger still, chose him for a second term, which gave him a clear mandate from you... to continue to murder our people in Iraq and Afghanistan". The speaker tells the American public that there are two ways to end the war in Iraq: "The first is from our side, and it is to continue to escalate the killing and fighting against you." The second way, he continues, is to reject America's democratic system and convert to Islam. "It has now become clear to you and the entire world the impotence of the democratic system and how it plays with the interest of the peoples and their blood by sacrificing soldiers and populations to achieve the interests of the major corporations". "I invite you to embrace Islam," the speaker says. The transcript also makes reference to French President Nicolas Sarkozy, which indicates that the tape was recorded after Mr Sarkozy's victory in May. The US Department of Homeland Security said it had no credible information of an imminent threat in the wake of the video announcement. Deputy State Department spokesman Tom Casey said: "I don't think that anything he is likely to say or do is going to change our resolve or the resolve of our international partners to confront extremism." But in a speech to the Council on Foreign Relations in New York on Friday, CIA director Michael Hayden warned that al-Qaeda was plotting new attacks on the US. "Our analysts assess with high confidence that al-Qaeda's central leadership is planning high impact plots against the American homeland," he said. "Al-Qaeda is focusing on targets that would produce mass casualties, dramatic destruction and significant economic aftershocks." 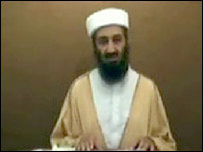 In his October 2004 video, Osama Bin Laden threatened new attacks against the US on the eve of the presidential election. Another tape - audio - was released in January 2006. It referred to identifiable events, including the situation in Somalia. Bin Laden did appear in footage on a militant website in July this year but the clip was undated and correspondents said it might be old footage, which had been recycled. The US Senate voted to double the bounty on Bin Laden to $50 million (£24.6 million) in July. Theres a big campaign in the US to make it a Theocracy - it would be funny if Bush said "Ok - but its Islamic". It's basically all made up in a back room at Langley. Didn't he score against us the other week? ""You permitted Bush to complete his first term, and stranger still, chose him for a second term, which gave him a clear mandate from you... to continue to murder our people in Iraq and Afghanistan"."